Life on the Edge, Continued - Thoughts From The Frontline - Investment Strategies, Analysis & Intelligence for Seasoned Investors. Many of my children had never seen me actually deliver a speech, especially to such a large crowd, and it felt good to have them there. At least initially, their being there helped take away some of the nervousness I felt about doing a brand new speech that we had literally changed three times in the previous 24 hours, as we reacted to the insights that emerged at the conference. It is ironic that I get more nervous speaking on my own turf that I do anywhere else. Part of it is the energy of the crowd, and part of it is the fact that every other speaker brings his or her A game to the Strategic Investment Conference. You can’t have a bad day at the podium when you’re the host. The conference itself was universally agreed to be the best ever. Rave reviews are showing up on Twitter, Facebook, and everywhere else. There are at least half a dozen presentations that I know I will want to listen to again. There was just too much content in them to absorb the first time. If somebody told me there were more 1,000 slides shown at the conference, I wouldn’t be surprised. 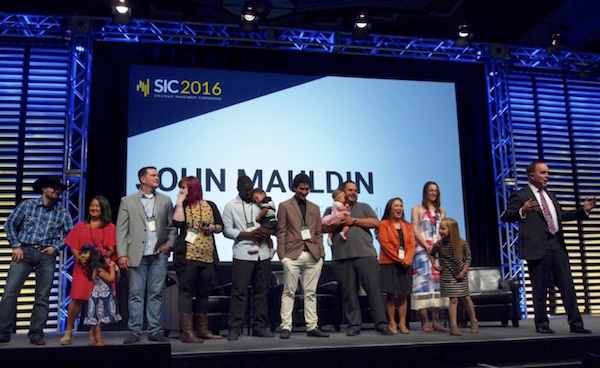 I really encourage you to consider purchasing the Virtual Pass to SIC 2016. It gives you access to nearly 20 hours of audio of the speakers, as well as their slide presentations. I think you’ll find their insights immensely useful as you make your own investment decisions. Coaches tell athletes that if they still have any energy left when they head back into the locker room when the game is over, they haven’t played hard enough. You’re supposed to leave it all on the field. That’s pretty much how I feel right now, so I don’t have a lot of energy to write a new letter. But thankfully, the comments we received from my May 15 letter, “Life on the Edge,” were among the best we’ve ever had. Let’s jump into the comments. John, thanks for this profound article about what is really happening in America (& much of the developed world) today; you have done the Protected a great service in helping them understand the unrest of the majority of Americans (& the Unprotected an even greater service into the future). It is unlikely this new awareness will change things without a coming voter revolt & even then change will be slow and unwelcome by most of us in the Protected category. The very fabric of what it is supposed to mean to be an American is at stake in this conflict, which is why Trump and Bernie represent today’s majority in different ways. If the Unprotected majority all voted (which is another change coming – many more likely will who haven’t cared about it in the past), it wouldn’t even be a close contest unless Donald and Bernie were the two candidates. Let’s hope this coming revolt is at the ballot box and not on the streets of American cities. JM: I am in total agreement about wanting the coming revolution to be fought at the ballot box. I had a conversation on this very topic with Juan Williams (the liberal analyst at Fox News) at lunch at the conference. He sees the revolt emerging, too. One of my deep anxieties is that the concerns of the unprotected will not really be addressed in the next administration, and we’ll go through a recession. I see the potential for an even more tumultuous political season in 2020. And, bluntly speaking, fixing immigration and possibly increasing tariffs – which would kill US jobs – are not the real sources of the angst. The source of the angst is the lack of growth in the economy, the monetary- and productivity-killing policies that will continue to destroy the middle class unless they are fixed. First class article! Interesting description of protected and unprotected cohorts. My answer is that we have secular cycles, 250–300 years long. Our current cycle peaked in about 1970, and now we are in the stagflation period of decline. This is not obvious to most, until recently, because credit bingeing has masked it. Today however we are seeing it in the deflationary spiral and NIRP rates not working. All Western societies are also demographically deflating as the Boomers retire @ 10,000 daily [US]. This means spending is deflating, and the “protected” are screwing up options for following generations, Millennials, to spend and invest since they are all in debt big time. We just have to wait for the crash, because the protected are willfully blind to it and no plans have been made ready to cope. We cannot avoid it. We have left it too late. Those few advanced nations that paid attention to this and implemented national policies to upgrade the skills of their workers are doing reasonably well: Germany, Singapore, Korea, Taiwan. Virtually all other nations that were already in the world trade system are the subjects of this article – the US, Britain, France, Italy, Greece, Iceland, Spain, Portugal, etc. Yes, the protected in all nations thrived – the rich by selling their products into ever growing markets and the symbolic analysts (that’s us word and number smiths) by managing ever larger and more complex systems. But the once-comfortable middle classes and protected working classes were savaged by competition from the foreign newcomers. Ironically, the demagogues they’re supporting in the American elections (and in France, Britain, Greece and other Western nations) do NOT have policies that will actually ameliorate the situation – trade protectionism, increased government regulation, higher minimum wages, more paid days off, et al. will only make things worse rather than better. Better in the long run has to come from returning to and promoting the fundamentals of economic growth – investing in worker skills, technology, and capital goods, reducing government intrusion into markets, and improving actual health (rather than “access” to health care programs – esp. ones that don’t truly work). Of these, the greatest leverage is found in allowing the private enterprise system to create jobs and by increasing worker skills. Adding physical capital (“capital deepening” – more capital goods employed per worker) runs a close third via its effect on improving productivity and thus wages. Sadly, it appears that Mr. Trump, Mrs. Clinton, and Mr. Sanders represent wrong directions – albeit different wrong directions. JM: Rolf, I think your overall comments are spot on. The problem about choosing directions, though, is that it is particularly difficult to get agreement on what the actual direction should be. After reading your comment, you and I could probably sit down and resolve the issue in 15 minutes. However, if we sat down with some of the other readers, getting that consensus would be decidedly more difficult. Some of the problems are indeed structural, and changing the very structure and nature of the country is a profoundly difficult thing to do. Change represents uncertainty and danger to those who are already living on the edge. Getting them to feel comfortable and positive about that direction is going to be very difficult. You nailed it John: described my last 15 years of supporting a family of 5 on 25–40K/yr since being laid off after saving my company over $500,000 in one year and why I have worked for myself the last 5 years about 60 hours a week in order to grow a business and pay others without being able to pay myself yet. Hope and a strategic plan still pulls me into the future, but many have lost that. And yes, I dislike both major party candidates but will likely vote for change. JM: I think you express a sentiment that I am hearing more and more everywhere I go. We have foregone the hope part of the equation, and now just want the change. And if the new change doesn’t work for us, you can bet that in 2020 we will be looking for more and different and deeper change. Excellent and insightful article which could be expanded to include other aspects. I keep wondering why the low interest rates that retirees often depend on for income do not receive more attention. While I have sympathy for the “unprotected,” having two children dealing with a life of reduced expectations, I also think that the “unprotected” should bear more responsibility for the situation we are in. Many are politically ignorant and vote for “feel good” programs which grow our government (and the establishment) while reducing the value of our currency. When I was 10 years old I could have handled a $400 unexpected expense without worry; could it be that someone is living beyond their means? JM – The low interest rates are financial repression writ large. In an effort to allow people to borrow more money at lower rates, make the investor class even wealthier, and of course help banks, savers and those who have done the right thing all their lives are being (and I use this term in its technical economic sense) screwed. Wonderful article, thoughtfully written and researched. I am watching my kids struggle in the unprotected category as I am one of the semi-protected who can no longer afford to protect my unprotected kids. It is painful. I am a psychologist and really appreciated the insight into shame. I do find that my clients find it far easier to talk about sexual problems than money problems. Definitely more shame there. Thank you so much for your continued sharing of knowledge and personal insights. In the beggar thy neighbor Darwinian world of business, what has been forgotten in the attempt to maximize profits is that the workers need disposable income in order to spend. With depressed spending the economy is depressed, thereby lowering profits as there are fewer sales. When 47% are living on the edge, you don’t have the spending. Don’t know how to stop the downward spiral. But surely some ideas, programs, public, private or any combination is needed to bring about a shift. Obviously, part of the problem is the loss of earning power of Boomers as they are now past their prime earning years (the youngest is 52) if not retiring for all the reasons – i.e. loss of job, illness/disability, age (the oldest is now 70) – which restricts their spending except for medical (a booming job area). Best article in a while, John. You discussed the problem that makes it hard to sleep at 3 a.m. Most things are never as complicated as [they are] made to appear. Basically, I believe the US, and many other developed economies, are living beyond their means. That is, the US developed a very strong economy following WWII, which elevated the standard of living for everyone. But during the last half of the 20th century we began to focus on things other than production, mostly at the demands of Progressives. Our ability to produce wealth diminished in relation to an increasing expected standard of living. Politicians focused on providing the ease that people wanted, and the nation focused mostly on social issues, and as recently as 4 years ago, chose a president strictly on the basis of social issues. Predictions, at this point, should follow simple reality. That is, if we don’t produce it, we won’t have it, and the general standard of living will decline. We can’t afford the government we have, or the magic of easy money they have created. When times are hard enough for long enough, the people will turn away from statism, Keynesianism, Socialism, and phony expectations of wellbeing. Meanwhile, as Churchill predicted, we will continue to try everything else. One if the metrics that you statisticians miss (or possible cannot quantify) is the presence of the grey and black market economy. I live in an area where you could literally trade for most services – food, rent, most of the M&R that you need. Yes, it’s in “the country,” where self-sufficiency is still an ethic. The things we cannot trade for we work for – medical, taxes, fuel, most utilities – and that distorts the relationship between real income and the cost of living. I’d like to see an article on how the “gettin’ by” economy works, but I must say, Mr. Mauldin, that you might have to bypass all those fancy meals in Abu Dhabi to really get any closer to the issue than your spreadsheets. JM: Bruce, I grew up in the “gettin’ by” economy and lived there up until my mid-30s. So I actually do understand the gray and black markets. I’ve actually done several letters on the research, and it is a truly misunderstood area. And you are spot on when you point out that it doesn’t show up in our spreadsheets. Which is just one more of the reasons that I continually say that I distrust the spreadsheets and the models. And for the record, I recognize how truly blessed and special my life has become in the last 10 years. I think that if I had had the type of success that I am now experiencing in my 20s, I wouldn’t appreciate and savor the moments nearly as much as I do today. I truly wake up every day in amazement. I sit down every week at my computer as I write my letter and say a little prayer, “Please God, don’t let the magic stop this week.” In a few months I will turn 67. I have no desire to stop – and in fact with all of those seven kids, I still have a need to keep working. I sometimes jokingly say that I don’t have seven children; I have seven cost centers. That said, I fully understand that I am part of the “protected class.” And to the extent that Dad is able to step in every now and then, so are my kids. When you sit with them and their friends, reality impinges very quickly. Bruce, I sometimes feel as if I’m living a surreal existence, occupying two very different spaces in the universe. What Peggy Noonan refers to as the “protected,” I call the “idiot elite.” Many of these people are in government, academe and the media. Two things that characterize most of them, I think, is that they have relatively high IQs and almost no direct contact with the private sector or “real economy” of making, marketing, distributing and selling things. Obama, for instance, said he felt he was almost “working behind enemy lines” during his very brief stint as a lawyer for a private firm. Many pols go from college straight into government without a clue as to how the wealth that supports government via taxes is produced. The same holds true with academics and media types who think their paychecks somehow come from the ether rather than jobs to support tuition payments, ads to support media outlets, etc. These people aren’t dumb, but they often lack judgment, emotional intelligence and experience. And many tend to be arrogant in their ignorance: If they don’t know about it or care about it, it doesn’t count. Thus we get “killing the golden goose” syndrome by people who really don’t know any better. Great Letter, John. Saw Neal Gabler’s article in the Atlantic, and he is a Brave Man! Hard to expose our weaknesses and keep people’s respect. There are many people in that situation. Been there and have family members under the poverty level. My brother & I have bailed her out over the years. My story is getting laid off from Manufacturing Engineering job in 2000 and being self-employed 2001–2008. Then consulted for 2 companies in 2 years. Learned a lot from running a business and consulting, but did not make a lot net. Hard to save when you are scraping along. It is difficult for small businesses – where the job growth comes from. Finally got a good-paying manufacturing engineering position, but had to move states away. My MBA wife was under contract to FDIC, and joined me 1-1/2 years later. Three years later she is still unemployed, trying, but English is her 2nd language. She does not interview well, and accounting salaries are lower here. So now we rely on my paycheck only and are protected only as long as my cyclical industry stays healthy. Second, in a low interest rate environment, how do you retire on savings? Our parents had pensions. Turning 401ks into salary is difficult for educated investors, and impossible for the average worker. We need a simpler tax system, help for 1–5 employee startups, and to be able to cover health emergencies and recoveries. We need to create more new businesses. How can we take medical and a pension with us? JM: Being able to take medical and pension benefits with you wherever you go is a truly necessary reform. There is a huge portion of the economy that now is basically on Form 1090 reportable income, and these jobs often come with no benefits and certainly no way to transport or create pensions or savings that exist in more normal working conditions. I have an hypothesis, which I can in no way support through my own economic research, that the problem with the US economy from the demand side is that retirees are getting very low returns on their savings. My retired mother lived very well on the return from 2 year t-bills in the 80s, 90s, and early 2000s, getting an average return of ~5%. Now, we’re getting $7500 per million on these instruments. We’ve had it drummed into us that we live off the interest, DON’T TOUCH THE PRINCIPAL. So we live off our SS, pensions, and the poor return from our bonds. But if these bonds returned what they did in previous decades, we’d spend it all! Instead, we hunker down. The Fed’s ZIRP only inflates the stock market (which, being our principal, we won’t touch), and kills our interest income, the discretionary part of our income, which we’d spend on our kids, grandkids, and stuff. My hypothesis is thus that financial repression is doing a lot more harm than good. Hi John, I appreciate you taking on tough subjects in addition to taxes recently. The US shares the Federal Reserve policies with other countries, as you mentioned, but where we differ is the trillions of dollars in deficit spending on the military and tax cuts for the so-called job creators. That obviously can’t continue unless we are running a sustained surplus. There are three areas not discussed often that assure we will not be competitive. The banking system in the US is really a drug cartel, no different than the ones in Mexico. Practically anyone breathing can borrow money, and people do so just like buying heroin. The dependency is fairly recent, since I can remember when layaway was the norm for Christmas and school clothes, and my mom made payments until it was paid off. There is good debt toward investments that have a positive net value, but nearly all other debt is a waste of money (just like recreational drugs). The other two items are overspending on the military and healthcare. These are much much bigger problems than money spent on so-called social programs – in fact they are true welfare programs (just try to take it away). To be competitive, these two categories really need to be cut in half or more. Just compare how much our competitors spend on military and healthcare. We rented “Where to Invade Next” by Michael Moore. It’s not about military at all, but presents some cultural norms in 6-8 different countries – hence invade the US with some cultural norms that could benefit our country. Poignant observations and recognition from John. Somehow, I sense John is feeling rather ‘conflicted’ and conscience is calling for a change too. Globalisation brought about 2 diametrically opposing shifts on wealth – one is concentration of wealth, the other is destruction of wealth by overconsumption, as apparent with our global warming problems. I always thought that being an American stood for something, and I was proud to have served my country in Vietnam, but I can remember watching Jack Welch, CEO of General Electric at the time, being interviewed on Face The Nation, where I heard him say that Labor is in competition with the Chinese. At that time I realized that Bill Clinton had lied to us about NAFTA and that being an American didn’t amount to much. I find it interesting that you can identify so readily with the plight of the “unprotected” and then in the next breath say that you are flying to Abu Dhabi the next day, First Class, I presume. As one who has attained the three score and ten age, primarily self-employed, I want to thank you for an article that is insightful and profound in giving clarity to our present economic, political, and geopolitical landscape. I share your concerns of unintended consequences from what may be rapid change. Experience has taught me that slow and steady, leaving things a little better off over time, brings about positive change. For that to occur it requires leadership, grounded in principles, exemplified by character. I hope this and other articles of its nature spark an intelligent public debate in the days going forward. With higher than average salaries than in the private market place, with great benefits and pensions, the political class in Washington, DC perch at the top tier of the protected class. In a statist state, they reap the greatest and most secure rewards. By contrast, more than 200 doctors committed suicide last year, the equivalent of a medical school class. These highly accomplished, hard-working professionals would surely be part of the protected class, one would think. But when the statists cut their reimbursements by up to 30% in 2010 with 45 days notice, many closed their medical practices or declared bankruptcy, losing their capital investment and firing many employees. They couldn’t cover their overhead. This was of no concern to the statists who feed at the public trough. Meanwhile, those doctors had to manage on average $169,000 in medical student debt plus college loans, not to speak of malpractice premiums. Over a 30-year payment amoritization, that medical student debt will cost them more than $400,000. So some doctors retired. Some became employed. And some killed themselves. That is of no concern to the statists. Excellent article. I read it just after reading Saturday’s WaPo article about a factory-working middle-class Indiana family whose factory is relocating to Mexico. Together, they illuminate the fear, resentment, and frustration felt by so many Americans, and explain their attraction to someone that we in the protected class cannot fathom. Our safety net needs a major upgrade. Welfare, unemployment and disability insurance create disincentives and are not geared for the 21st century “gig economy.” Attempts to correct for the “income gap” have led to minimum wage legislation and healthcare mandates for businesses that have “unintended consequences,” which any idiot could have anticipated. The case must be made for linking our safety net with the tax code. By linking an Unconditional Basic Income for all citizens with a flat tax [25%], a graph of Net Income versus Gross Income would start at the poverty level, with the individual keeping 75% of Gross Income, a flat line sloping upward. The effective tax rate would go from negative to approaching the flat tax rate on a smooth curve. Immigrants would receive no federal money, but legal immigrants would receive a rebate up to that same poverty level, based on taxes paid. States and charities would focus on individual needs. Those with no income would receive the UBI as a replacement for welfare, those with some income would have a clear path out of poverty and a net increase, and for those with significant incomes the UBI would replace deductions, but would be capped. On the other hand the maximum tax rate would also be capped. I enjoy these thoughtful and intellectual discussions, but of course they are much more than intellectuals thinking out loud when you consider the noise outside the door from the “unprotected” and the demagogues like Trump egging them on in their unhappiness. There is hardly a soul in the country let alone in the world not feeling the effects of the global “adjustments,” including the 1%, who no doubt are quite worried about hanging onto their wealth. Like other cycles, I believe a lot of what is happening is the period of a cycle during which severe economic inequality, violence, and an unjust imbalance, as Mr. Mauldin points out, between inflation for the poor and middle class and deflation for the rich is taking place. Another pattern that has troubled me for some time and which the current economic pain and stress may actually impact favorably, was the rampant excesses of the prior era of wealth. Americans grew insatiable appetites for everything from outsized homes to multiple vehicles to all sorts of RVs, extravagant gas-guzzling cigarette boats for example. Americans reveled in NASCAR; we spend billions on arenas, I mean football stadiums; we glorify gladiators, I mean the NFL players; we have rewarded lobbyists, hedge fund managers and entertainers beyond any reason; we have borrowed to support excesses of all kinds; and we in general have become lost in the capitalist wilderness. Money and the stuff it can purchase became our golden calf in front of which we worship. We placed “In God we trust” on our money so that it has become really, in our money god we trust. We celebrate lawyers who are trained to assist the guilty to get off or who help their clients feed off of others through false suits. We have become a nation wherein few take full responsibility for their actions, a larger percentage look to live off the system, doing little of any value, where the mass media perpetually feeds the populace with the most torrid and inane diversions, “entertainment” appealing to the lowest values, lowest levels of intelligence or respect possible. We have done this to ourselves, so there is no reason to lament or tear our robes. The unprotected gobble up the rude and aggressive entertainment; they spend their spare change on Harley Davidsons, drugs and take pride in their disrespect for ethics, authority or even responsibility. This nation takes pride in being the world bully and we build endlessly more advanced and more lethal weaponry with which to exert our muscle around the globe. Quite frankly, rather than lamenting the perceived state of our economy, this is really a time for America to get some humility, to find its roots again. We were first colonized by the Pilgrims, initially for the purpose of living a pure and spiritual life away from the tyranny of the 1% and religious oppression. If this cycle forces Americans to adjust their lifestylse to more modest standards (no more McMansions I would hope, no more cigarette boats I would hope, less waste and ostentatious spending, cutting government waste etc., etc. ), then I would consider it worthwhile. This is a phase in a cycle, and rather than fret, and rather than the Fed trying to keep it going by feeding another set of bubbles, we should embrace the opportunity to recover our lost values and focus on what is really essential in life, not the excesses and wastefulness of a false prosperity. John, you seem to be finally becoming aware of how inequality is causing our political and economic problems. When inequality is too large, it causes a lack of demand compared to supply and slows economic growth. Slowly, both the Left and the Right are coming to the realization that too much inequality is a very, very serious problem. It is a problem for the “protected” as well because it invariably leads to social unrest. As you can see in my comment, I am a strong proponent of an improved safety net. Inequality may be a problem for other countries, but the problem in the US has more to do with interference by government as reflected in the cost of goods, since the cost of taxes, mandates, and regulation must be reflected in prices charged, which slows economic growth. We would be far better off with greater inequality as long as those at the bottom have a reasonable chance to take advantage of the growing economy and the opportunities presented. Inequality does not lessen demand, it only shifts demand from consumables to investments, which must ultimately be spent on capital goods and job creation, promoting growth. Nedland Williams, I completely disagree. I have shared a wide diversity of comments, even though some of the topics touched on don’t elicit a personal response from me. I really do read the responses to my articles. Your feedback is important to me. In particular, this “Life on the Edge” article really did seem to strike a nerve. The majority of my readers – certainly not all – are in the protected class. And yet, when I hear from them, and when I talked with them at the conference, they are increasingly uncomfortable with the status quo and what is happening with the middle class and the rest of our nation. They inherently recognize that this situation can’t continue without change and resolution. We had approximately 50% more people at this conference than we’ve ever had. Part of that growth was due to the marketing team at Mauldin Economics, but I think there is a general angst among investors who are worried about the future and see that something different and very important is happening in the world. They looked at our lineup, said, “I need answers,” and became part of our sold-out crowd. What struck me was a general acknowledgment that something is going to have to be done, and soon (soon as in the next 5 to 10 years) about the global debt situation and the buildup of unfunded liabilities, not just in the US but all over the world. The growing global imbalances were highlighted. And while there was mostly nervousness about the US stock market and valuations, this was not a bearish, buy golden guns and go home group of speakers. Most of them talked about opportunities in sectors other than large-cap US equities. Over the next few weeks, as I sit and think about the presentations and go back and re-listen to some of them, I will share with you not just a summary recap but rather my attempt to incorporate the themes and ideas expressed into a coherent set of thoughts that can inform our investment strategies. And of course I will share my own ideas and thoughts from my speech. But if you want to start catching up, you can go to liveblog.mauldineconomics.com and see conference videos and summaries of the speeches. We had a number of people blogging during the conference, and many of the speakers agreed to do short interviews. It’s all there for you. I’m going to hit the send button and maybe take a science fiction book and go sit by the pool. Who knows, I may even nod off… I’m sure my adrenaline will get recharged over the next few days, and I’ll be ready to dive back into the fray, but right now I’m going to pay attention to my body and kick back. You have a great week.